Hi, I'd like to show you this page I found on Ryan Furniture's website. Information Accuracy - We strive to provide accurate, up to date product information, but there may be slight differences between our website and store. Please stop in, call or click Request More Info to confirm information about fabrics, colors, prices and availability. 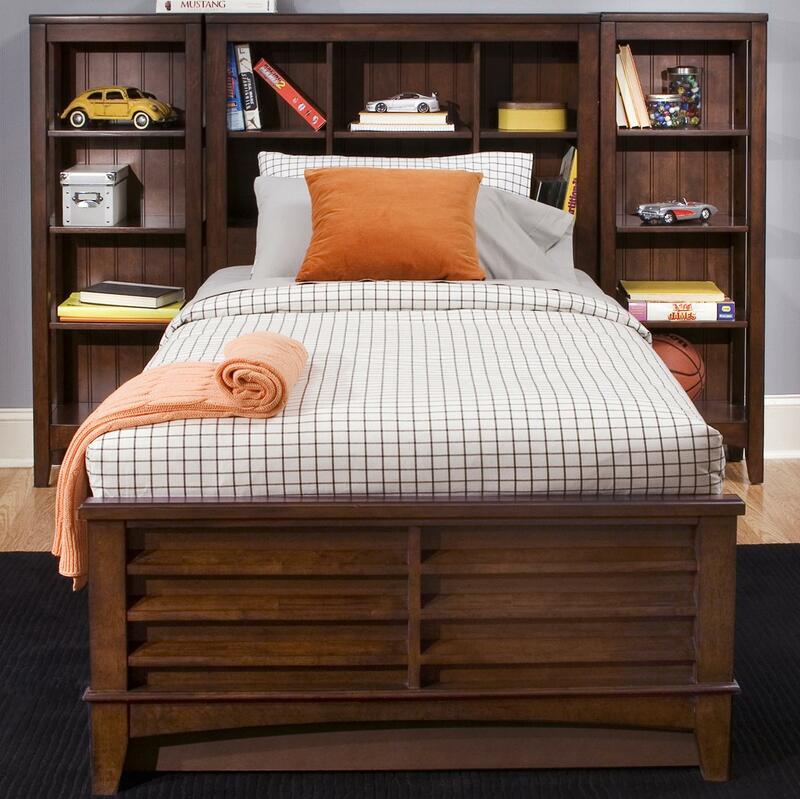 This pier bed is the perfect simple storage bed for your youth's bedroom. It features an inlaid panel on the footboard with an arched bottom. 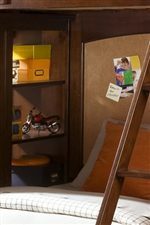 The headboard features six open above bed compartments for books, lamps, toys, and more, and is bookended by eight more open shelves. Pair this bed with the student desk and desk chair, and student bookcases for a youth room full of storage and style. This bed is available in twin and full sizes. 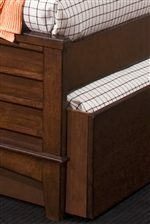 The Chelsea Square Youth 14 Shelf Twin Pier Bed by Liberty Furniture at Ryan Furniture in the Havre De Grace, Maryland, Aberdeen, Bel Air North, Churchville area. Product availability may vary. Contact us for the most current availability on this product. Finish & Paint Options "Burnished Tobacco" finish. Handles & Hardware Antique Brass Knobs and Bail Pulls. Drawer / Shelf Construction All wood dovetail drawer construction; dust proofing; screwed flush mounted back panels. Felt lined top drawers. Drawer Suspension Wood on wood drawer guides. Bed Construction Bolt-on rail system. Warranty One year from the date of purchase. Will not apply to damage arising from neglect, accidental or intentional damage, freight damage, institutional or commercial use, damage or wear due to exposure to extreme sun light, temperature, moisture or humidity. The Chelsea Square Youth collection is a diverse and functional group for the youth in your life. It brings with it a depth of character and abounding storage. The entire collection is completed with a Burnished Tobacco finish and detailed with antique brass hardware. The youth in your life will be excited by the storage, functionality, and playful nature of these bedroom pieces. Many pieces are perfect for sibling sharing or friends to use for sleepovers. This collection will give your youth an exercise in organization and style, while also being a mostly condensed collection, thus giving tons of functionality for the space that it takes up. For a collection your youth can grow into while helping to consolidate and organize your home, look no further than the Chelsea Square Youth collection. The Chelsea Square Youth collection is a great option if you are looking for Transitional furniture in the Havre De Grace, Maryland, Aberdeen, Bel Air North, Churchville area. Browse other items in the Chelsea Square Youth collection from Ryan Furniture in the Havre De Grace, Maryland, Aberdeen, Bel Air North, Churchville area. Ryan Furniture features a great selection of living room, bedroom, dining room, home office, entertainment, accent, furniture, and mattresses, and can help you with your home design and decorating. View recent additions to our online furniture gallery. Ryan Furniture offers great quality furniture, at a low price to the Baltimore, Maryland, Riverside, Elkton, Bel Air South, Bel Air, Kingsville, Perry Hall, Pleasant Hills area.